While visiting the Garden of Gethsemane, we discovered four leaf clovers growing in the garden having blood red spots. Inquiring about the unique clover. what we learned was astounding. It’s believed that during His agony while praying in the garden sweaty blood fell from his brow to the ground, staining the four-leaf clovers growing in the garden. What’s even more remarkable is the red spotted clovers still grow in the Garden of Gethsemane today, and according to our guides no other place in the world. Do I believe that blood stained clovers grow only in the Garden of Gethsemane today? Since posting this information I have received comments that declare these same four leaf clovers with red spots do grow in other parts of the world also. I have found these growing in Banks Peninsula, Christchurch New Zealand. I have a small plant I’m trying to grow taken from my granny’s garden where there is an abundance of these clover plants. Im sure that over the centuries theses species of clover have somehow found their way to various places around the globe. Hi, today I just found these all over an entire neighborhood while going door to door in my ministry (I’m one of Jehovah’s Witnesses). I’m in Memphis TN. Was delighted to see them for the first time in my life. Happy for your discovery of this beautiful of clover. While touring Israel in 2008 a tour guide told us this species was found only in the Garden of Gethsemane. Since I first wrote this article I have been alerted to the fact these clover also grow in other parts of the world. They’re in my backyard. In El Dorado, Arkansas. 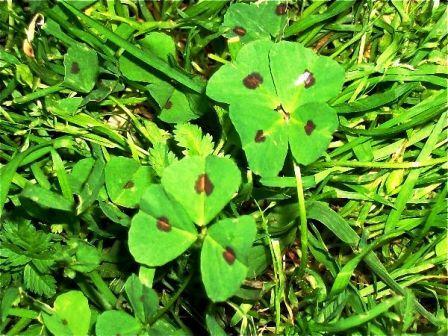 Since posting this information I have received comments that declare these same four leaf clovers with red spots do grow in other parts of the world also. Therefore I have rewritten the original post. I have found them in two places I’ve visited in Georgia. Um…it grows in my back yard. I’m in Atlanta. Amanda this may be true but I believe the species I am referring to originated in Israel. This is what we were told when on tour of the Holy Lands in 2008. I suppose that after two thousand years the possibility of this species migrating to other parts of the globe is a reasonable fact. Thanks Frank, That was informative.